What Does Jeff Sessions’ Exit Mean for Federal Pot Policy? After recapturing control of the House on Tuesday, some progressive Democrats were itching for party leaders to finally tackle marijuana and criminal justice reform, but they knew they had a Jeff Sessions-sized road block to overcome. 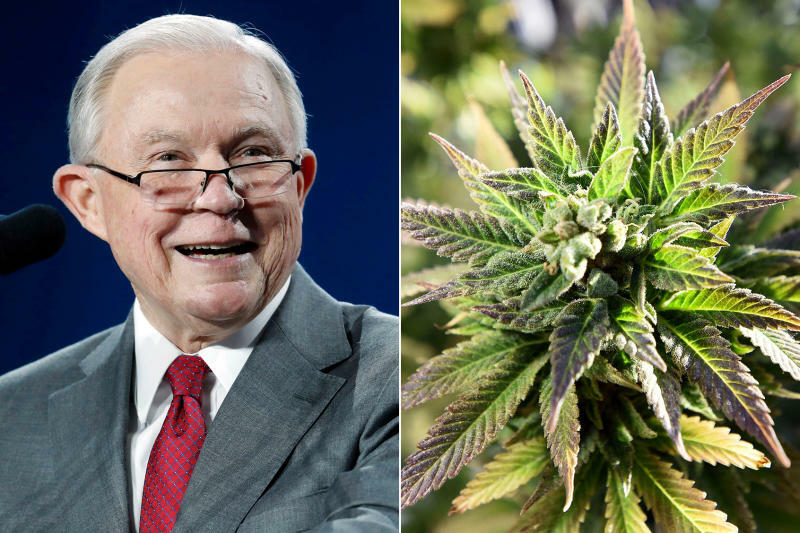 Now that President Trump ingloriously shoved him out as attorney general Wednesday, there’s more optimism that a sweeping overhaul of drug policy is possible. The announcement of Sessions’ forced exit isn’t exactly a surprise — Trump left no question that the former Alabama senator lost his favor for recusing himself from leading the FBI investigation into the Trump Administration’s ties to Russia, which led to the hiring of special counsel Robert Mueller. That has many Democrats and some Republicans crying foul as they look for ways to protect the investigation going forward. But when it comes to Sessions’ prohibitionist, tough-on-crime drug policy, other lawmakers are cheering. But those cheers over Sessions’ ouster may be premature. Trump has been vague on marijuana, and he’s signaled he supports a states right approach that would allow localities to decide their own policies. Still, the president’s senior advisors have yet to even try to negotiate a way forward with Congress. That worries proponents. Now that Trump’s searching for a new attorney general, Garrett worries he won’t even ask about marijuana or criminal justice reform, and he doubts Trump’s senior advisors will steer him towards a pro-pot candidate. Advocates are now sizing up Matthew Whitaker, Sessions’ former chief of staff, named by the president to temporarily fill the vacancy. Whitaker is hard to peg on marijuana or criminal justice reform — but so far it’s not looking good. The advocacy site Marijuana Moment mined through his sparse public record and found video of him discussing it during his failed 2014 Iowa Senate bid. The video shows Whitaker praising state lawmakers who had just passed a medical cannabis law that only allowed CBD — a compound found in marijuana that has medicinal uses, but doesn’t include the THC, which makes you high. Yet the former U.S. attorney criticized then-Attorney General Eric Holder’s policy of allowing states to essentially break federal law by legalizing marijuana, and lambasted weed for causing crime. “And if you go to any of the counties in Texas where there’s an illegal importation of marijuana, there’s a tremendous amount of violence,” Whitaker said. Some analysts speculate Whitaker, who’s under scrutiny for arguing that the Russia probe should be limited in scope, is being given a tryout by Trump. But for now, he’s only got the top post on an interim basis. That gives marijuana proponents hope that the president may still pick a permanent AG who’s more sympathetic to their cause, especially because marijuana isn’t a partisan issue. A number of recent polls show more than 60 percent of Americans support legalizing weed, including one by Gallup showing support at an eye-popping 66 percent. And it’s now legal for medicinal purposes in more than 30 states and for recreational use in 10 states after Michigan voters resoundingly passed it Tuesday. That has a growing number of Republicans backing their voter’s decisions to legalize it. That soaring popularity of the formerly forbidden plant has some optimistic Trump himself will realize he can capitalize on that while also gaining leverage on one of his pet issues. Even with his muted optimism that the next attorney general will be better than Sessions on pot, Correa and others want senators to press the eventual nominee on marijuana in their confirmation hearing. “It may not be the Mueller issue, but it’s an important issue,” Correa says. And there’s more than just legalizing marijuana that drug policy advocates are considering. During his last year in the Senate, Sessions was instrumental in corralling enough conservative opposition in the Senate to derail the Sentencing Reform and Corrections Act — a broad bipartisan bill to greatly curtail mandatory minimum prison sentences, including for nonviolent drug offenders. Then when Sessions was sent to the Justice Department he worked behind the scenes to scuttle the effort. Over his protests a bipartisan group of House members eventually watered the legislation down and this year they overwhelmingly passed The First Step Act which is solely focused on curtailing the nation’s high recidivism rate. It’s been sitting in the Senate since, because a bipartisan block of senators have demanded prison reform be included in it. Both of those bills have been championed by some of the nation’s most strident conservatives, which is why prison reform advocates see Sessions’ departure as a huge opening. Many Democrats are now coming to Sessions’ defense because of his recusal in the Russia probe, but they don’t like him. In his relatively brief stint as attorney general Sessions also angered many Republicans, including Senate Judiciary Chair Chuck Grassley for his intransigence on prison reform and Sen. Cory Gardner (R-CO) for his attempts to prosecute marijuana business owners and users in states where it’s legal. Advocates say that should be a lesson to anyone Trump eventually taps to take over for him.